Food pouches are a fact of life for many parents today, myself included. They are just so convenient to grab and go for busy families. They can be eaten with little mess and you don't need a spoon. Not only do my kids love them (well some of the flavors), but I have started to have some as snacks as well. The drawbacks to these pouches are the expense and the garbage they produce. Little Green Pouch wants to change that. The moms behind this company were fed up with disposable pouches for the exact same reasons I just mentioned. This is when they developed their reusable food pouches. I have seen products like this before, but when the company emailed me to see if I would like to review them, I was curious about what made these different. Plus, my wife and I just had another baby so I knew we would be going through more pouches than ever. When they arrived they definitely looked interesting. The spout protrudes from the side and you load them through the top. We are huge smoothie fans in our family. We make spinach and fresh fruit smoothies 3-4 times a week for breakfast. The issues is that they take tons of time to make each day. 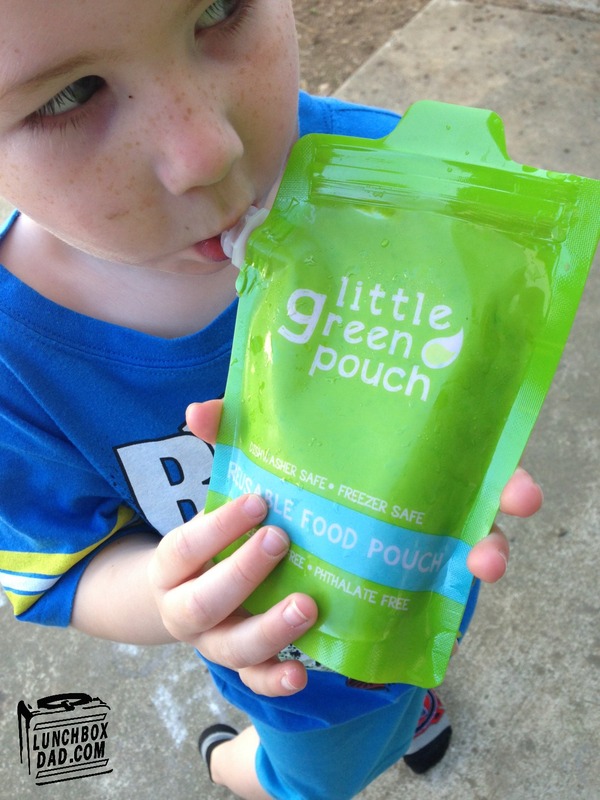 We put our Little Green Pouches to work and filled them with smoothies. The first time filling it was honestly a little tricky. You can use a funnel, spoon, or spout to fill the pouches. Each item helps tremendously but I like the funnel because you can fill the pouches quickly. The problem was I filled it a little too quickly and I couldn't get the top shut. I found the trick is to fill it with a little less than you think you need. You seal the pouch with a plastic zipper seal. I thought I had it sealed but then it blew open because I hadn't sealed it well. It was really my own fault though for not checking. After the first time, I easily sealed the pouches no problem and have had no issues ever since. I threw the smoothie pouches in the freezer and used them a couple days later. I just ran one under warm water and it was ready to eat. My 3 year old had no problems with them and they work well for just about any pureed food you fill them with. I have also washed them numerous times now and they have done fine in the dishwasher, as well as being hand washed. it is actually easy to clean them because of the large opening in the top. You might need a bottle brush for stubborn or dried on foods. I am also impressed with the amount of accessories you can buy from Little Green Pouch. You can get extra lids, water dissolving labels (which definitely come in handy), silicone straw extensions, and more. All of these items are available on their website. Speaking of which, I was thrilled by their recipe section on the website as well. If you are wondering what to fill the pouches with, they have you covered. Overall, I would highly recommend these pouches. Their durability seems good and the ease of cleaning impressed me. You can buy them online in a pack of four for $14.99. 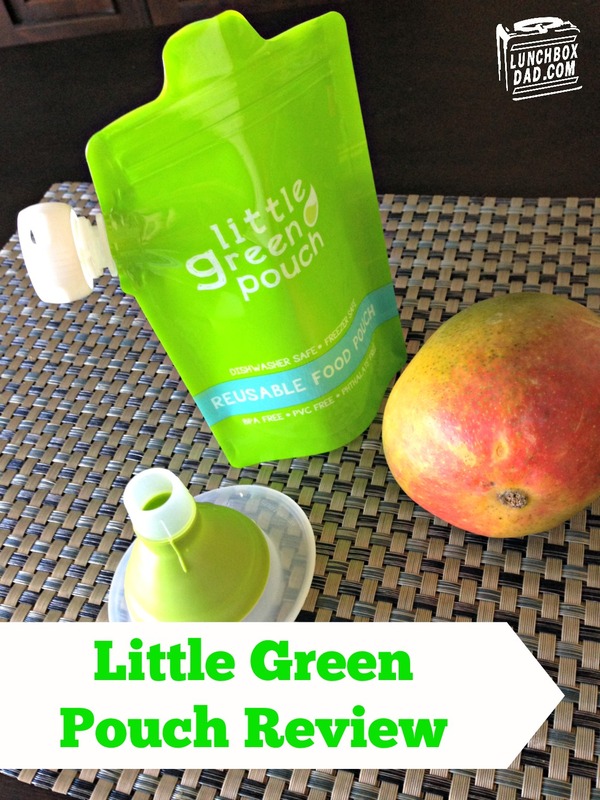 Check out www.littlegreenpouch.com for more information and to see their whole line of pouch accessories too! Disclosure: Little Green Pouch gave me their products to review. I have received no other compensation for this post and the opinions I’m expressing here are solely my own.